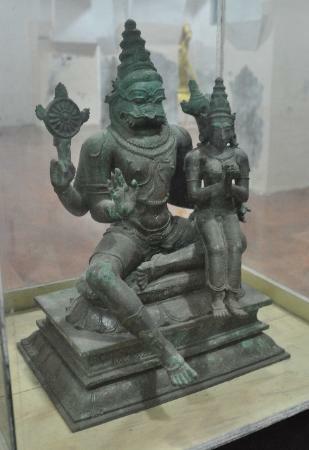 This image shows Narasimha, the man-lion, with his consort. 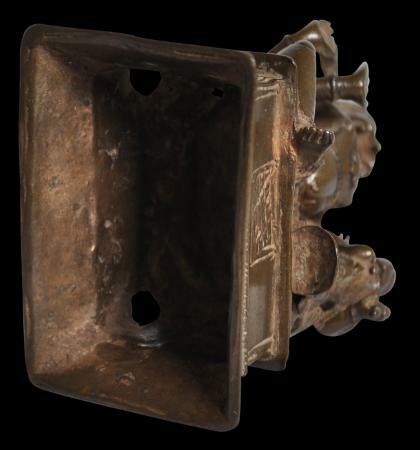 The image has been cast using the lost-wax process and has then been refined with chiselling and engraving. 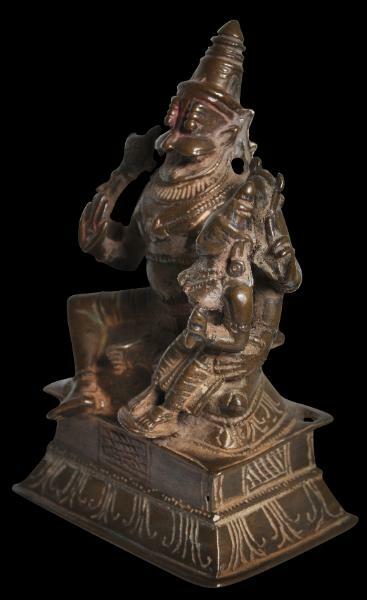 Narasimha is shown seated on a rectangular pedestal throne. He has four arms, and a dramatic face with bulging eyes, bulging cheeks and a gaping mouth. The consort here is Lakshmi (also known as Sri Devi). 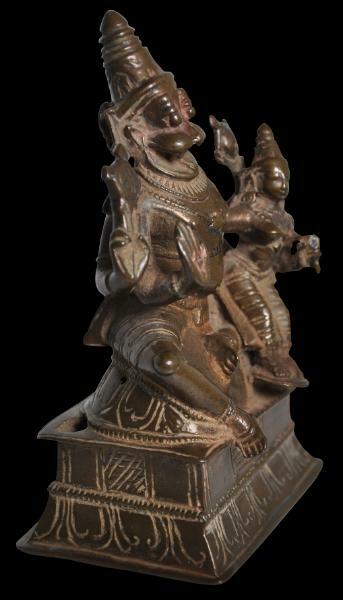 She sits on Narasimha’s left knee. His lower left hand rests on her hip and her right hand is placed on the small of his back for balance. vitarka mudhra. He is seated on an oval lotus throne that is atop a two-tiered rectangular dais that has been engraved with lotus petal motifs. dhoti garments and jewellery, and tall, conical headdresses. Narasimha is one of the eight avatars of Vishnu. The deity’s name derives from two words: ‘nara’ meaning ‘man’ and ‘simha’ meaning ‘lion’. Vishnu assumed the appearance of a half-man half-beast to overcome a demon king who could not be killed by either a man or a beast. The lion characteristics as manifested in the deity’s face are fierceness, bravery and independence. Representations of Narasimha often are found in stone relief in temples in Tamil Nadu, where this avatar of Vishnu is popularly portrayed. 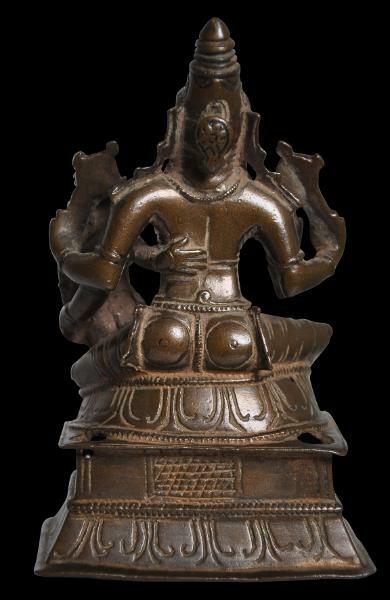 puja wear, and a milk-chocolate patina. 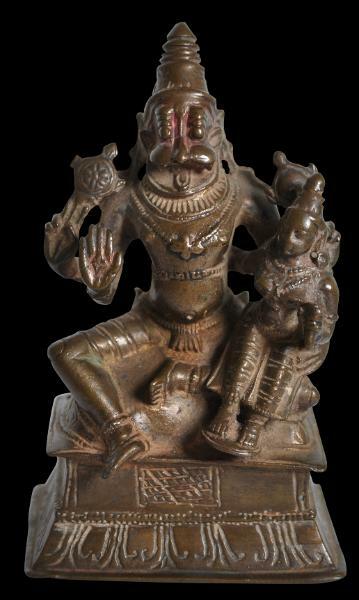 Lakshmi-Narasimha bronze, South India, 15th-16th century. Photographed Maratha Palace, Tanjore, South India, December 2014.